Ötzi Dorf is a recreation of a neolithic village in the unspoilt Ötztal valley in the Austrian Tirol. 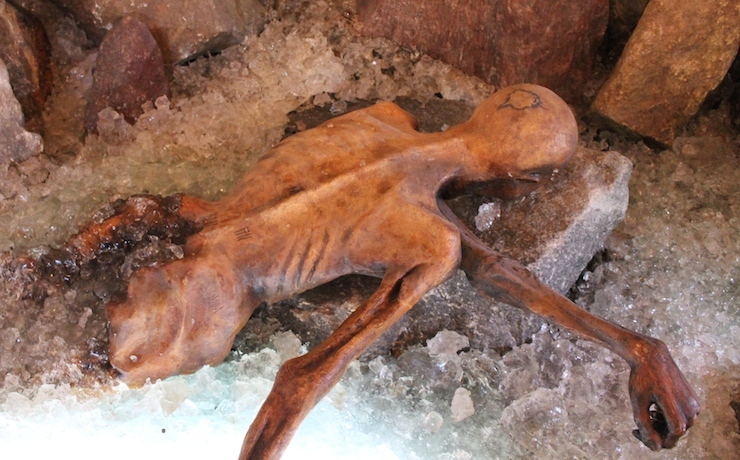 The open-air museum was inspired by the discovery of the body of a prehistoric man frozen in the mountains on the Italian-Austrian border in 1991. A couple of hikers found Ötzi (as he was named, after the area he died in) and his body is now preserved in a museum in Italy. Ötzi Dorf shows what life was like in Neolithic times when Ötzi lived. Visitors are encouraged to touch and try out the ‘stone-age’ exhibits in the village and there are regular interactive demonstrations during the summer. I visited Ötzi Dorf with my 11 year-old son while we were staying further up the valley at Obergurgl in August. We were shown around by an excellent English-speaking guide, Silvana Scheiber. There are guided tours of the village every day during the summer season but if you want a tour in English you need to book ahead. There are also audio guides available in English. Silvana explained that scientists believe that Ötzi lived around 5,000 years ago and that he was in his late 40s when he died. When Ötzi was found his body was so well-preserved by the ice that even the pores on his skin were still visible. X-rays have revealed how he died: an arrowhead in his shoulder caused him to bleed to death. Silvana showed us a model of Ötzi’s body as it was discovered in 1991. Many items were found with Ötzi’s body and these reveal a lot about his way of life in Neolithic times. From the bearskin hat and the other clothes which he wore to the copper-headed axe, birch bark containers and backpack he carried, Ötzi made ingenious use of the materials available to him. The Ötzi Dorf museum shows how these things would have been used. My son enjoyed handling the reproduction stone-age tools which are dotted around the village and trying on a wood and animal skin backpack like the one found with Ötzi. During July and August there are activities on offer such as archery, clay pottery, fire lighting and bread making at Stone Age days two or three times a week. 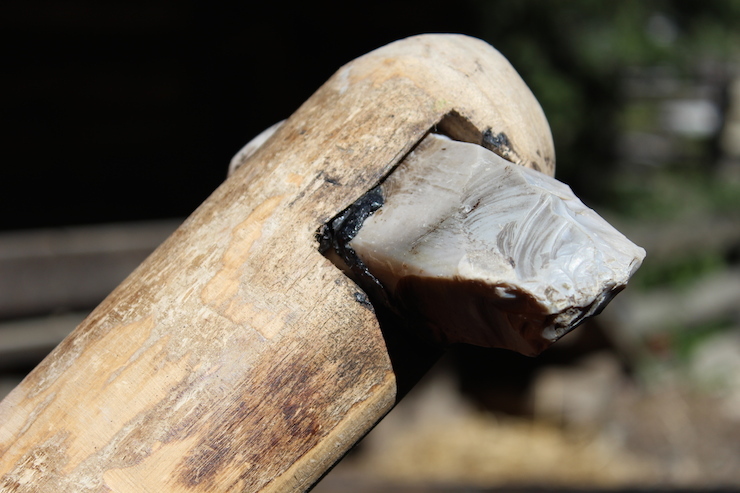 It wasn’t a Stone Age day when we visited but my son was fascinated when we found fire-making equipment in one of the wooden huts and Silvana showed us how to make sparks using a piece of flint and a piece of pyrite. He even bought an Ötzi fire lighting kit from the gift shop to take on our next camping trip. Ötzi Dorf is home to various ancient breeds of farm animals which would have been around in Ötzi’s time (but not necessarily in this part of the world). The animals include wild Przewalski horses, woolly pigs and Soay sheep which lose their wool naturally and so don’t need shearing. There’s a small café at Ötzi Dorf and there’s also la cascata, an Italian restaurant (run by Austrians) about two minutes walk away. My caesar salad was fine and my son said his spaghetti bolognese was ‘OK’ when we had lunch there. The restaurant has a lovely terrace overlooking a play area and a small swimming lake both of which you have to pay to use. If you feel like a hike the Stuibenfall (the highest waterfall in the Tirol at 159m) is about 30 minutes’ walk from Ötzi Dorf. 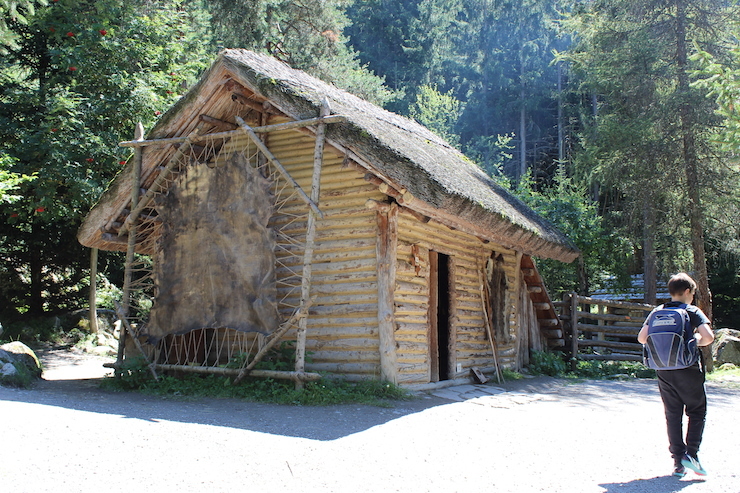 My son and I both enjoyed visiting Ötzi Dorf and found it interesting, although I’d have liked to go there on one of the activity days. If you’re planning to visit Ötzi Dorf then it’s best to check the website in advance to see what’s happening. Entrance to Ötzi Dorf costs 6.80 euros per adult, 3.30 euros per six -15 year-old, under-6s are free. Entrance includes scheduled guided tours (but you need to book in advance for an English-speaking guide). Thank you to Ötzi Dorf for providing our tickets and guide and to the Tirol Tourist Board and Thomson Lakes & Mountains for arranging our trip to Austria. This looks fantastic. The picture of Otzi is amazing! I think my kids would love this – what a different and interesting thing to do. Wow, Otzi really is terribly well-preserved. This looks like a fascinating place – perfect for a tween’s questioning mind, I’ll bet. It is amazing to see Otzi and learn about his life thousands of years ago.